Capricorn means business—both literally and metaphorically. We do not get to pass through the gateway of Capricorn without performing an analysis (conscious or not) of the basic foundations that ensure we survive and thrive in our environments. If life feels a little heavy now, that is why. We’re immersed in the Capricorn lunar cycle. The New Moon* of New Year’s Day is waxing to fullness this week, so the pressure is mounting. A lot of my own personal practice centers around noticing when this type of stress is present and then finding a way to acknowledge why, what I can learn, and how to shift it into energy, action, or a state of being that is useful for my well-being and for the success of the things I care about. Stress isn’t useful, but I do think stress shows up because something important is going on. With the helpful lens of Capricorn pragmatism, I am looking at my stressors critically. Am I reacting habitually, without cause? Or am I concerned because I need to pay attention? Business. Most of us have a reaction to that word. A lot of us could benefit from giving it a new frame. I appreciate Capricorn for these equations: to receive, we must give; to achieve, we must work; to lay strong foundations, we must know what we are putting down and why. To continue to co-create the worlds we envision, we must get down to business—at least for as long as this lunar cycle lasts! And if Capricorn plays into your essential nature, this point of view is your gift to all of us. If life feels heavy, if you are noticing more stress, invite in an appreciation that the heaviness and stress are the messengers announcing that something that matters very much is going on. Our job is to figure out what that is and to respond without retaining the heaviness and stress as we get down to business. Sunday, January 12. As a mutable sign, Gemini is gifted with the ability to change form easily in response to external stimuli. On one hand, this is helpful in adjusting to and releasing stress due to change. On the other hand, stress also can come from not fully knowing where we are anchored. This month as we attend to our foundations, Gemini may struggle with the tension between solidity and mutability. All points of view are needed; all energy is a gift. Gemini says, “Lighten up!” We don’t have to throw the baby out with the bath water. [Sorry, that aphorism has been floating around my mind recently.] Can you invite in an appreciation for change while you anchor yourself to your core structure? With the Moon in Gemini, we dance with paradox. Enlightenment is around the corner. Monday, January 13. With the Moon still in Gemini until this evening (in the CST zone), invent a mantra to help you navigate the terrain of shifting foundations. The one that occurs to me: Be shackled to nothing, question everything, choose your beliefs, entertain possibilities, welcome surprise. We can find delight wherever we are, but this doesn’t mean we have to shut down our hearts. Not an easy thing to do. The edge today between the mutable air of Gemini and the cardinal water of Cancer is noticeable. My primary value as an astrologer is that every sign is necessary and we learn from them all. The emotional sensitivity of the Cancer Moon develops strongly over the next two days, culminating in the Full Moon in Cancer. Abstract concepts become very real when our hearts start talking. Tuesday, January 14. Emotional reality is tricky, just like all other realities. The input may be clear [insert whatever emotion you happen to be feeling], but the reason for and value of the emotion may not be. How do we discern whether an emotional reality is helpful or harmful? I’m beginning to appreciate emotion as ally helping me to be fully awake in my body, heart, and mind. Through emotion, we can inhabit states of empathy, love, gratitude and a host of other feelings that make us better humans. And sometimes emotion brings us into patterns that we may want to consciously shift. The journey goes on. Today’s emotional reality is colored by the planets of paradigm change—Uranus, Pluto, and Jupiter. Tomorrow, Mars adds another hue. The Full Moon tomorrow is already felt as tension between a desire for solid foundations and a feeling that everything is about to change. Honor your tender heart. We are sorting and discerning what to keep in our foundations. Emotional reality plays a big role in this process. 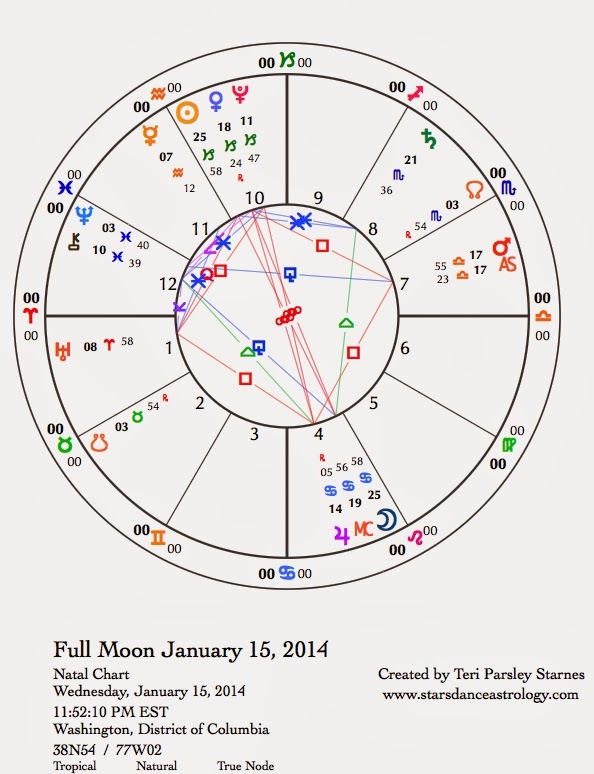 January 15—Full Moon: Illuminating. Every Full Moon offers us the opportunity to integrate opposite signs, opposite truths, opposite qualities that together form a whole greater than their parts. This Full Moon feels very important. Even though the lessons are challenging, our experiences now will help us navigate the rest of this year, which promises to be one of big change. You may be feeling foundations shifting, some structures already falling. I keep thinking about the Tower card in the Tarot. This card depicts the type of foundational change we are facing. Change, like the process of grief, takes many forms. Each of us has our own way of dealing with it and our own patterns of being eager for change while also being afraid of its uncertainty. With an eye focused on the gifts of Capricorn and Cancer, how might we embrace the fullness of change? As a water sign, Cancer helps us dissolve the current structures, which no longer serve. As an earth sign, Capricorn helps us cement the foundations we need to build our future upon. Both the heart and the head are needed. As I’ve been thinking of my own choices around foundations this lunar cycle, I’ve developed a list of questions as a guide. Foundations and change—what do I keep; what do I change? Our allies and teachers of the moment. Venus retrograding through Capricorn helps us pay attention to what is beautiful and sustaining. Pluto in Capricorn has entered a new segment of that sign. From now till April when Pluto stations retrograde, we are uncovering new shadows that need transformation in our foundations. Mars in Libra for the next six months encourages desire for balance and justice. Jupiter in Cancer tells us that big truth comes from our hearths and hearts. Uranus, ever impatient, but more so now, keeps the fire under us to embrace change. Saturn in Scorpio says look deeply at the sources of comfort and stability. At the core, all beings need the same things. Neptune and Chiron in Pisces continue the heartbeat of universal compassion. Mercury, in Aquarius until the end of the month, encourages experimentation. Accepting our failures, we evolve new successes. Thursday, January 16. The gift of Leo is creative energy. What sparks your desire to create? Venus in Capricorn squares Mars in Libra today—an interesting addition to creative endeavors. Squares create through tension. There is tension between our notions of sustainable beauty and the active pursuit of harmony. In a way, these desires are perfectly aligned, but hidden tension reveals even more potential. Think of it as an intriguing puzzle—how to satisfy all of our desires. At times, that feels unrealistic, today entertain the possibility that it isn’t. Saturday, January 18. Notice the contrasting energies of expansion and contraction. The last couple of days may have felt more expansive with a boost from a Leo Moon. Today, that Leo Moon is square to Saturn and then moves into pragmatic Virgo by the evening (in CST zone). Did some creative exuberance help you to identify the foundational structure you cherish most? Did you receive inspiration about sustainable change? Were you able to creatively problem solve? Use today’s transits to make one solid step in the direction you discovered. The gift of Virgo is the steadiness of slow but sure progress.